What is the purpose of Elijah's travels? At the beginning of 2 Kings 2, Elijah travels from Gilgal to Bethel to Jericho to the Jordan before being taken up in the whirlwind. Elisha then mostly reverses this course crossing back over the Jordan, going up to Jericho on to Bethel and from there returning to Samaria. One commentary I read mentioned that this is a rather indirect route for Elijah to leave the land, but didn't comment beyond that. I've noted on Mike's answer below that there seems to be some relationship to Joshua. The progression of the armies in Joshua goes from crossing the Jordan to the destruction of Jericho, to a battle at Ai and Bethel, to encampment at Gilgal. So Elijah retraces the conquest, but in reverse. My question, though, still is why? What is the author saying by showing Elijah take this path at the command of the LORD? And also (and maybe this could be a different question), why does Elijah keep telling Elisha to stay at each of the cities rather than follow him? 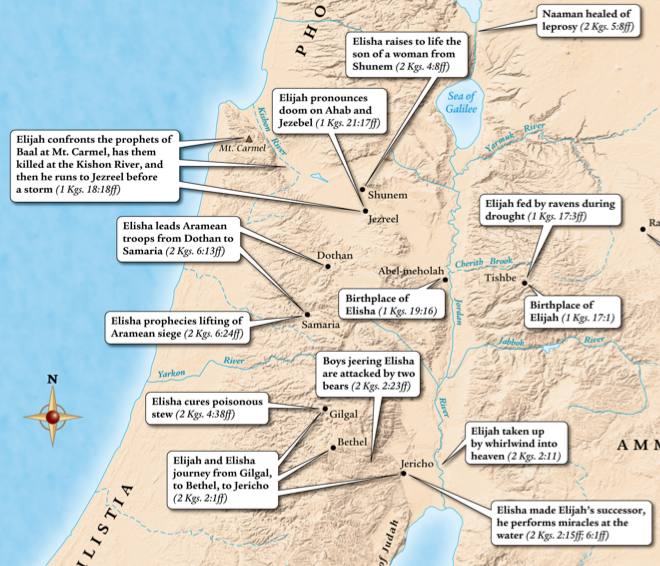 The location of Gilgal is crucial in this response - the Gilgal mentioned in the battles of Joshua is most likely not the same location as that mentioned in the travels of Elijah and Elisha. The maps below show the different proposed locations of each. It is possible that there are as many as four different locations referred to as Gilgal in the bible. 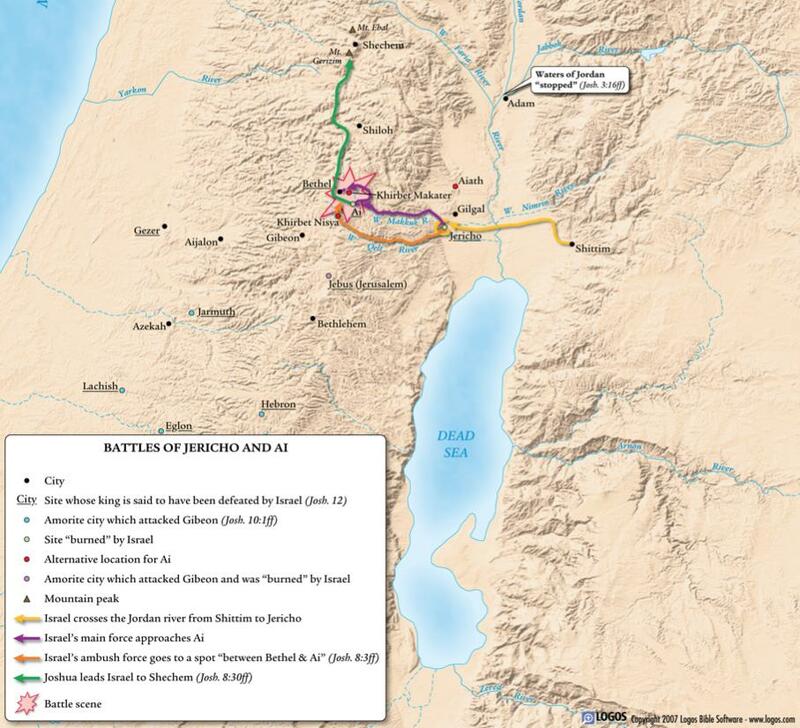 Most theories stick with two cities named Gilgal: one in Samaria and one near Jericho. In light of the fact that separate Gilgal's are most likely in mind here, one perspective is that neither Elijah nor Elisha were retracing Joshua's conquest. 2 Kings 2:2 states that Elijah and Elisha "went down to Bethel" from Gilgal, suggesting that the place was in the vicinity of Bethel, and hence in a mountainous region (and at higher elevation than Bethel), which is somewhat different from the place associated with Joshua. It is clear that these cities contained communities of prophets, which seems to be the primary reason for visiting. At the same time, there are scholars who would consider the Gilgal in the Joshua account to be the same as that of the Elijah/Elisha narrative, but even then the exact location is not agreed upon so it is difficult to speculate as to whether or not this route is actually "out of the way" or not. Maps ©2007 Logos Bible Software. I will try to answer with emphasis on spiritual significance. Elijah is coming to the final stage of transference to Elisha, who had followed Elijah for the last 14 years. A) his Mantle B) his spirit C) his God. The background and context of 2king chapter 2 is Israel spiritual decline and decay. Gilgal was the spiritual peak and from that spiritual position in God, Joshua led the 3 campaigns in the conquest of Canaan and it was their spiritual HQ. Bethel is the House of God and Jericho means the first fruit. Elijah brought Elisha on this specific route for the purpose to let Elisha 'catch' his heart cry on the spiritual state of decay in these 3 important and strategic spiritual places. Elijah must ensured Elisha will continue his legacy to restore God's Kingdom in Isreal. These cities are considered to be special locations where there were schools for groups of prophets. That is why in each place 'the sons of the prophets' are interacting with Elijah and Elisha. For some reason Elijah was called to give some last words of preparation for them before he left the earth. It seems his impending departure was in some sense enjoined with some sense of dangers and Elijah seems to wish Elisha saftey from the dangers, but whether he inteded to be testing Elisha's commitment or not, the situation does seem to draw out Eliasha as a faithful disciple. The whole account seems to have prepared Elisha and the sons of the prophets for Elijah's departure, in some ways similar to Christ preparing his disciples before being caught up in the clouds. This is more or less a summary of observations made by Alfred Edersheim in his enjoyable read Bible History Old Testament. Elijah is on a journey to the eternal land of God’s rest. He starts in Gilgal, which is a throwback to Egypt. At Gilgal “the shame of Egypt” was removed (Joshua 5:8-10), when the foreskins of the Israelites were taken away. Bethel is a throwback to Sinai, when the dwelling of God came to earth. (The Shekinah was the dwelling place of God.) Bethel in Hebrew means the house of God. Finally, after the Israelites left Sinai, they had circled the wilderness before arriving at the River Jordan. Jericho therefore was a throwback to the (circular) wilderness wanderings, where the desert was a place of death and unfruitfulness (2 Kings 2:22). Joshua had circled the city before destroying it. Thus Elijah makes a trek to follow the pattern of the Israelites who left Egypt and finally entered the rest of the Promised Land. Elijah therefore followed this earthly pattern in a reverse imagery (if you will), so that when he crossed the Jordan he entered the rest of the heavenly Promised Land. By asking Elijah to remain in each locale, Elijah was essentially testing Elisha, since Elisha was his protégé. (“Would Elisha remain in ‘the wilderness of Zin,’ or would he proceed forward to cross the Jordan as an obedient Israelite?”) Of course, Elisha wanted to follow Elijah wherever he went. Elisha passed the test, and therefore was qualified to replace Elijah. After Elijah was taken into heaven, Elisha “returned to earth” by back-tracking the same steps. (Elisha made the “death and unfruitfulness” of Jericho’s “desert” into potable water in 2 Kings 2:22). He goes through Bethel, where (like at Sinai with Moses) insolence and insubordination was evident toward God’s prophet, Elisha (2 Kings 2:23). As his final destination, instead of returning to “Egypt” (Gilgal), he returned to Mount Carmel, which is where Elijah’s ministry had ended, and where of course Elisha’s ministry was going to begin. Theologically, this whole episode of Elijah crossing the Jordan and entering heaven is of immense significance hermeneutically. First and foremost, this is the first instance within the Hebrew Bible that there is direct parallel between the visible "rest" of God and the invisible "rest" of God. In other words, the biblical concept of "the Promised Land" (God's place of rest) is not limited only to the visible geographical area of Palestine, which was promised to Abraham. For example, the author of the Book of Hebrews enters his theological discourse by indicating that the "rest" of God follows death (see Hebrews Chap. 3 and Chap. 4, where the concept of the afterlife is developed from the Hebrew Bible). In other words, when we depart our terrestrial existence on earth, we "cross the River Jordan" and enter the rest of God. (Death is not a "dead end" for the elect of God.) Many 19th century church hymns talk of this crossing. For example, when he died on the battlefield during the Civil War in 1863, Stonewall Jackson is said to have remarked, "Let us cross over the river, and rest under the shade of the trees." Last but not least, Elijah did not experience physical death. He went into heaven, and therefore heaven is a literal place. Later in the Hebrew Bible (in fact among the last verses of the English translation of the Old Testament), there is indication that Elijah will physically return to earth "before the great and terrible Day of the Lord," and so there is still an expectation (among Jewish and some Christian students of the Bible) that this Prophet will yet return to earth physically in the future. While Malachi 4:6 is attributed to John the Baptist in Luke 1:17, the verses in both Malachi 4:6 and Malachi 4:5 also seem to point to "Elijah the Prophet," who will return to earth "before the great and terrible Day of the Lord" and announce the [second] coming of the Messiah to earth. Briefly, the cities seem to have historical significance. It does not appear that Elijah is retracing Joshua's journey although there is some overlap. Gilgal is most like a reference to the location of Israel's first camp in the land and the beginning of their spiritual journey with the Lord as the reproach of Egypt is rolled away. Bethel marks the encounter of Jacob with the Lord on his journey to Haran and back. Stopping short of Bethel at Shechem cost him dearly but he did return to Bethel. Bethel has negative connotations during the kings as a center of idolatry but for Jacob it was a godly site. Jericho was the first city Israel conquered in the land and was claimed as the first fruits by the Lord so placed under the ban. It marked their journey into Canaan as one of war and dependence upon the Lord. Jordan was the initial boundary for the Promised Land. Moses could not enter but Joshua let Israel on their journey across the Jordan (on dry ground) just like Egypt and Elijah (2:8). Acceptance of the Trans-jordan as part of Israel was a deal worked out between Moses and the 2 & 1/2 tribes. Crossing Jordan in hymnology signals death/rest but not in the Scripture. They crossed Jordan, entered the Promsied Land but began the battle. It was not rest it was war. The sum seems to be a reminder that these folks were pilgrims in the land looking for the greater city. Elijah is another pilgrim but his journey ended in a more visible entrance into the Lord's presence. In the NFL, much is made of "coaching trees." A coaching tree occurs when a prolific coach has disciples who serve faithfully as offensive or defensive coordinators under him. When the second level of coaches become head coaches and have their own successes, they inevitably point back to the one prolific coach they all learned from and served under. Bill Parcells, when asked about the success of the coaches who had served under him, responded, "Hey, it's those that follow;" meaning those who put in their dues earn the right to receive the mantle themselves one day. With 2 Kings 2:1-12, we have just such an occurrence of the torch being passed from one generation to another. The passage is full of feeling and pathos. You can hear the hurt in Elisha's responses to the prophets. His words about Elijah are not "my mentor" but rather "my father." One wonders if there were not tears in both of their eyes as they made this final journey together. Their route, which can easily be missed or dismissed as insignificant, actually seems to be critical to understanding the entire episode. The route is both spiritual and social. As others have well noted in answering, the route has multiple layers of significance. One view sees the route as memorial in nature; a trip down the nation and people's spiritual history. Another sees it as symbolic of the upward climb to the journey over Jordan to Heaven. These may both add tremendous value to the meaning conveyed by the expositor. I would add that there is an equally important social introduction of Elisha as the replacement for Elijah. Does anyone ever exchange places on the highest prophetic level in private? One seminary president leaves and another comes amid great ceremony and blessing. One pastor exits and another is installed with prayer and a laying on of hands. Hereto, Elisha is paraded both by God and his earthly mentor. When Elisha returns, he will carry Elijah's prophetic responsibilities and--most importantly--a double portion of God's Holy Spirit to anoint his work. Far more than just one link in Elijah's spiritual "coaching tree," this is a testimony to the tears and triumphs inherent in a true Biblical ministry. Not the answer you're looking for? Browse other questions tagged 2-kings elijah or ask your own question. What is the literary purpose of not naming the king in 2 Kings 5-7? What does “when children come to the moment of birth and there is no strength” mean in 2 Kings 19:3? What do the jeers towards Elisha of “Go on up” mean? What time was the evening sacrifice in 1 Kings 18:27? What is the meaning of Elijah's reply to Elisha in 1 Kings 19:20? Why wasn't Elijah's credibility affected after unclean birds (ravens) fed him for so long? Was it the action of the two captains that caused the death of the hundred soldiers in 2 Kings 1? In 2 Kings 4:38-41 why did the prophets of Gilgal still put poison or death (Hades) in the pot after Elijah's and Elisha's reformation?